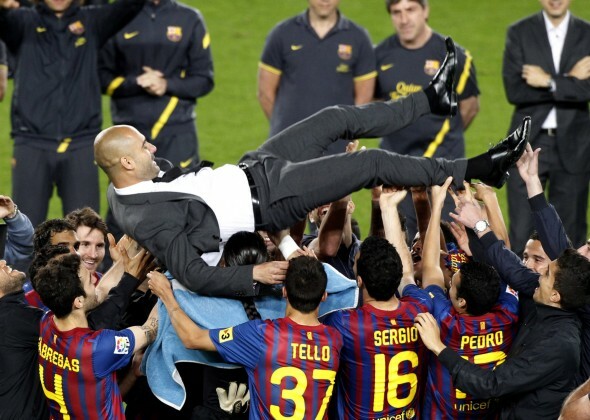 Pep Guardiola’s final home game in charge of Barcelona welcomed the visit of Mauricio Pochettino’s Espanyol side to Camp Nou. What turned out to be a very comfortable win for Barcelona was played, with a few exceptions, at a generally low tempo throughout especially the first half. The game had the feel of an end of season encounter with nothing at stake. The highlights, as ever, arrived via Lionel Messi. Following the clásico defeat, Barcelona have scored 11 goals and conceded just one in their two games against Rayo Vallecano and Malaga, each game seeing a few changes in personnel. José Pinto continued in goal ahead of Víctor Valdés owing to a combination of Valdés wishing to win the Zamora Award and also due to Pinto’s appearance in the forthcoming Copa del Rey final, the game provided much needed match practice. Martín Montoya made his second start at right back in the last three games and there were also starting places for Thiago Alcântara, Seydou Keita and Pedro Rodriguez. Espanyol entered the game with their season more or less over. Similar to last season, they began brightly and harboured hopes of European football before declining sharply in the new year. Never in any danger of relegation this season, los periquitos’ recent form of just one win in eight games effectively killed off any thoughts of entertaining European football at the Estadi Cornella-El Prat next season. Pochettino made just one change from the side which lost away to Granada midweek, with Héctor Moreno replacing Romaric. This necessitated a reshuffle with Juan Forlín moved out to right back and Javi Lopez starting in a defensive midfield position. As Barcelona began to exert a little more influence over proceedings mainly via Andres Iniesta on the left drifting inward, and Forlin at right back hindered by his early caution, Messi won and scored from a free kick after 11 minutes. Espanyol retained a narrow 4-3-3 shape with a high defensive line and little space between the lines due to their generally compact shape. 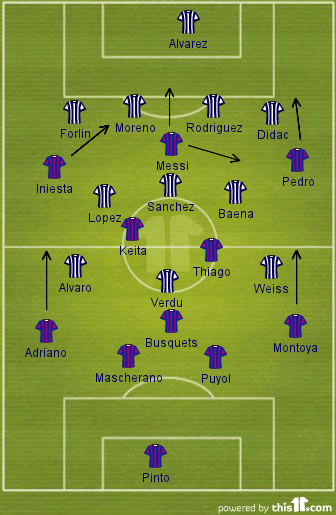 There was space wide with Espanyol holding a narrow line across the width of their penalty area but this was never really exploited by Barcelona. Iniesta preferring to move inside and Pedro still searching for form. When Espanyol attacked, all their creative play came via Joan Verdu operating centrally and Vladimir Weiss coming inside form the right. Trailing 2-0, Pochettino replaced AlvaroVazquez with Philippe Coutinho leaving Espanyol with no recognised striker on the pitch for the remaining 27 minutes of the game. There were options on the bench in the shape of Kalu Uche and Walter Pandiani but neither is going to provide the level of mobility and fluidity that Pochettino was clearly seeking from his team in an attacking sense. 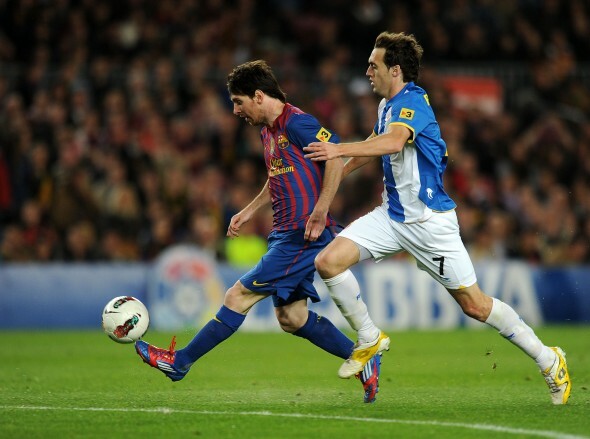 messi wont stop breakin records i pray he wil mak his own.